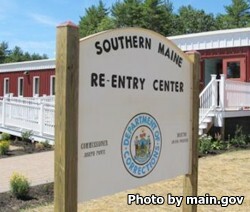 Southern Maine Re-entry Center is located in Alfred Maine. It is a re-entry center that houses minimum custody female offenders who are being prepared to be reintroduced into society. This facility can house up to 64 women. In order to be eligible for the re-entry center the inmate must have about one year left to serve, be classified as a minimum custody inmate, and demonstrated a positive crime free lifestyle while incarcerated at Windham. While incarcerated at Southern Maine Re-entry Center inmates can obtain their GED, take college courses and learn vocational skills. Offenders can also receive treatment for substance abuse, anger management, and other behavioral problems. All inmates will be designated a work assignment while housed at this facility. You must call (207)-490-5205 Monday-Friday between the hours of 12:30pm-4pm to schedule a visit. All visits occur on Saturdays and Sundays between the hours of 12:30pm and 4:30pm. This facility is unique in that it allows visitors to bring certain food items to visitation including a homemade meal, store bought meal, and fast food. A small bag of candy and single desert are also allowed. Soda and drinks cannot be glass or can, they must come in a sealed plastic bottle. For more information call the facility.